The Ergovision 65 is a compact LCD mount. 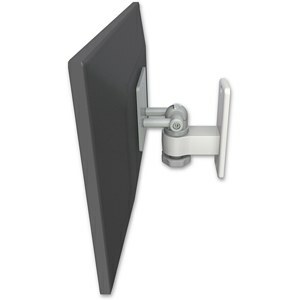 When you need your monitor close to the mounting surface but still want to retain monitor tilt and pivot, this is the mount you are looking for. The monitor can pivot up to 180°, pan 90°, and tilt up to 75° (depending on monitor size). A 100 mm VESA interface plate is provided. This model mounts to a wall. Machined out of aircraft-quality aluminum, this unit is powder coated for a durable, lasting finish. Hand assembly ensures that a quality product is shipped to you.